Going out of any cup competition is a painful experience and certainly a defeat in the FA Cup has always been one of the low points of any season. Defeats became more common place during our time in the basement division and 1st and 2nd round exits were now common place. But how has an FA Cup defeat reached fourth place in our 100 Great Moments? We need to go back eleven seasons and for the third season in succession we had reached the 3rd round. 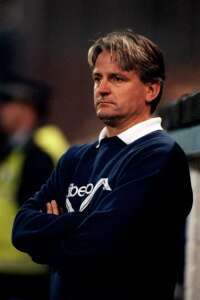 It had come courtesy of wins against two fellow 4th Division clubs in Doncaster Rovers and Rotherham United. 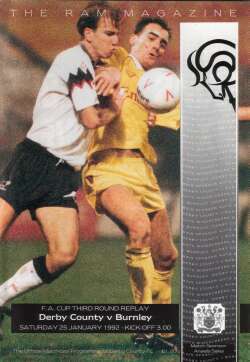 We were drawn against then 2nd Division Derby County. It was a cracking game at the Turf that ended 2-2 with our late equaliser coming from a superb header from Roger Eli; our first goal was scored by Steve Harper. That gave us a midweek visit to the Baseball Ground and a night when something unexpected came to our rescue. With Derby beating us 2-0 the fog came down and gave referee Redfearn no option but to call it off for the night. That meant a return to the Baseball Ground, it was played on 4th round day, and it didn’t seem anything was going to be any different. We were a goal down at half time and not too long into the second half a dreadful error by goalkeeper Chris Pearce saw us 2-0 down as had been the case a week and a half earlier. No we didn’t fight back, although we didn’t conceded another goal and eventually went out, but what happened next will live with me and everyone there for as long as we think of Burnley Football Club. There was nothing exceptional to see on the pitch, no streakers or wonder goals, just an FA Cup tie coming to an inevitable conclusion. But in the double decker stand housing the Burnley fans there was to be the most phenomenal show of support I had ever seen, a show that has never been repeated and almost certainly never will. It started just as we were restarting after the second goal, a few fans on their feet starting what was thought to be a short chant of ‘Jimmy Mullen’s Claret and Blue Army’. There were just a few of them and they were on their feet and singing it to a dance beat. For whatever reason they didn’t stop and more joined in. More did I say? In fact just about everybody in both tiers of that stand. I was in the upper tier and with everyone on their feet the whole structure was moving considerably. It got louder and louder, most were on their feet dancing, and it just didn’t stop. On a number of occasions Derby keeper Peter Shilton, right in front of the Burnley fans, turned and applauded. So did the Derby fans who had never witnessed anything quite like it. Surely it wouldn’t go on until the final whistle, well no not quite because the final whistle didn’t stop it. It just went on and on and on long after the game had finished. In the end an emotional Jimmy Mullen returned with his players for one last curtain call and eventually the Burnley fans were persuaded to leave. We were out of the FA Cup but that time at Derby will live with me forever. I just felt proud and privileged to be amongst the greatest football supporters in the world on such a special occasion. Derby's General Manager at that time Michael Dunford in a letter to Burnley FC said, "We must praise your supporters for the fantastic support they gave your club particularly in the last match. With fear of contradiction the fervour of the support was probably the best we have encountered from a visiting club in over 10 years. They were absolutely superb." And a Derby season ticket holder Gordon Rice added, "Your supporters were the best I have ever seen during the many years I have been watching Derby County. Even when their team were trailing by two goals they continued with their noisy support for their team. They were astonishing." For more on that day read the John Sadler from the Sun newspaper. It has happened just once in our entire history and that was as far back as 1914 when we beat Liverpool in the final to win the FA Cup. There have been two finals since in 1947 and 1962, both at Wembley, but this triumph at Crystal Palace remains our only success in the cup. It was without doubt a match of firsts and lasts. Not only was it the first time we had won the competition but it was also the first time the reigning monarch had attended the final but King George V was there to present the trophy. 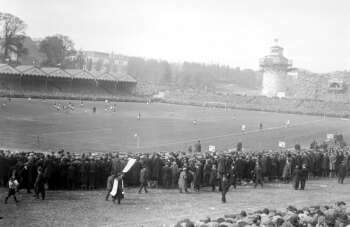 It was the last time a final was played at Crystal Palace. It was moved to Old Trafford the following year and then to Stamford Bridge after the war until Wembley opened. We had reached the semi-final a year earlier but were beaten by Sunderland in a replay at Birmingham’s St. Andrew’s following a draw at Bramall Lane but this time there was to be no mistake. The cup campaign got off to a good start with a 3-1 home win against South Shields in the 1st round and further home ties in rounds 2 and 3 saw us beat Derby County and then Bolton Wanderers. Round 4 though saw us once again paired with Sunderland and this was going to be a difficult tie against the team in 3rd place in Division One particularly with the game being played at Roker Park. We battled hard though and earned a replay with a 0-0 draw and four days later won that replay 2-1 to secure a place in the semi-finals for the second successive season. 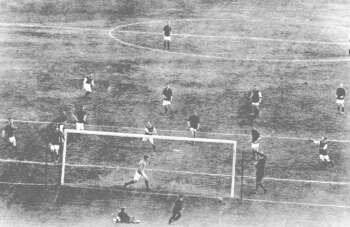 It was to be Sheffield United and Old Trafford was chosen as the venue and in what proved to be a very tight semi-final the game ended all square at 0-0 and the following Wednesday we had to start all over again at Goodison Park. This time we won through by the narrowest of margins with captain Tommy Boyle scoring the only goal of the game and for the first time in the club’s history we had made the final against fellow Lancastrians Liverpool also in the final for the first time. The talk all week centred around local goalkeeper Jerry Dawson. Considered as good as any keeper in the country Dawson was injured in the first of the two semi-finals and was still doubtful for the big day. It wasn’t to be a fairy tale recovery for the Cliviger goalkeeper though and Dawson missed out with Ronnie Sewell deputising had he had done in the semi-final replay. He was not to let the Clarets down. The 25th April 1914 is one of the greatest dates in our club’s history, the day we lifted the FA Cup for the first (and right now the only) time. It was a narrow win but a goal from Bert Freeman was enough to see the Clarets home and ensure that Tommy Boyle was the first up the steps at the end and the first captain ever to receive the trophy from the King. Burnley celebrated, the town went wild, and on their return the team went on a tour of the town on a horse drawn carriage starting at Rosegrove station where their journey back from London ended. Some of the names from the final team are well known. There is scorer Bert Freeman, and his cup winners’ medal is on display at Towneley Hall, and of course the half back line of Halley, Boyle and Watson. But they were all Claret heroes that day and the team was: Sewell; Bamford, Taylor; Halley, Boyle, Watson; Nesbitt, Lindley, Freeman, Hodgson and Mosscrop. Hopefully one day another Burnley team will lift the FA Cup to emulate the team of 1914, the first Burnley team to lift a major trophy.